I love Giada de Laurentiis recipes. I don't think I have ever tried her deserts but I did this weekend! I embarked on an adventure of a lot of new things. 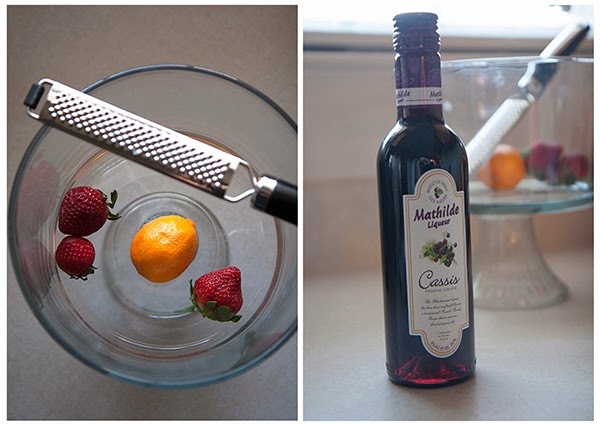 I had never used crème de cassis liqueur nor had I ever used mascarpone cheese. Well, here's to a new future of using the both of them! I was afraid this little tasty trifle would be dry because of the cheese and pound cake but Giada knows what she is doing. This trifle was a little taste of spring and sunshine on a chilly day. Trifles are awesome because the are generally very easy to make and can serve as an impressive centerpiece for your table if you would like. And there is no wrong way to layer these things! I got rave reviews by my taste-testers and I hope you do too! In a small saucepan over medium heat, combine the sugar with the lemon juice. Cook until the sugar has dissolved, about 5 minutes. Let cool. 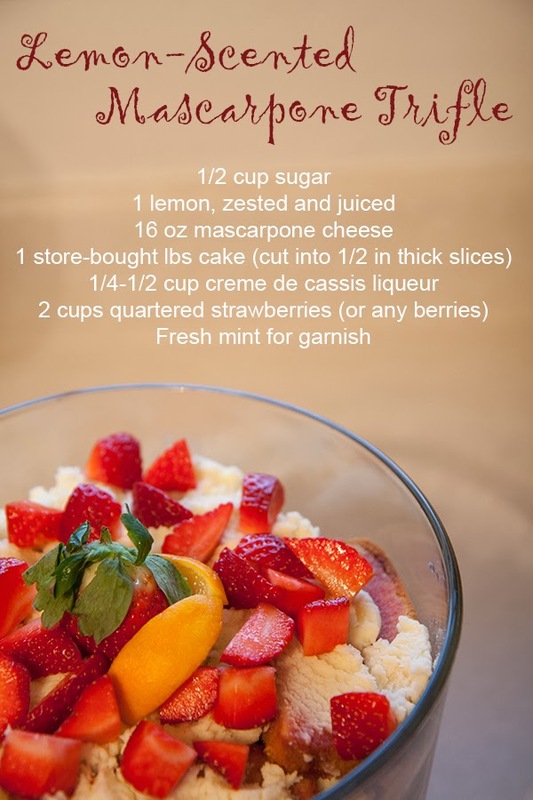 In medium bowl, combine the cooled sugar mixture with the mascarpone cheese and the lemon zest. Using an electric mixer, whip on medium speed until the mixture is lightly fluffy. To build the trifle, line the bottom of the trifle bowl with a layer of pound cake. Brush the cake with some crème de cassis liqueur. Spoon a layer of the cheese mixture over the pound cake and then a layer of berries. Repeat the layers until all the ingredients are used, finishing with a top layer of berries. Chill in the refrigerator until ready to serve. Garnish with mint if you would like. TGIF: Start your healthy weekend!